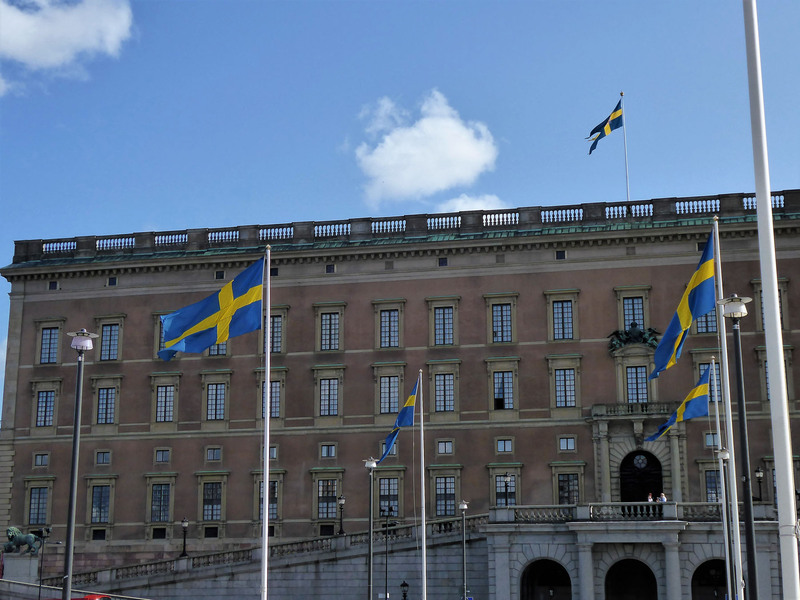 An impulsive decision to rush off to see Stockholm in a fair-weather window, followed by some restful days around Rosersberg Castle north of the city. 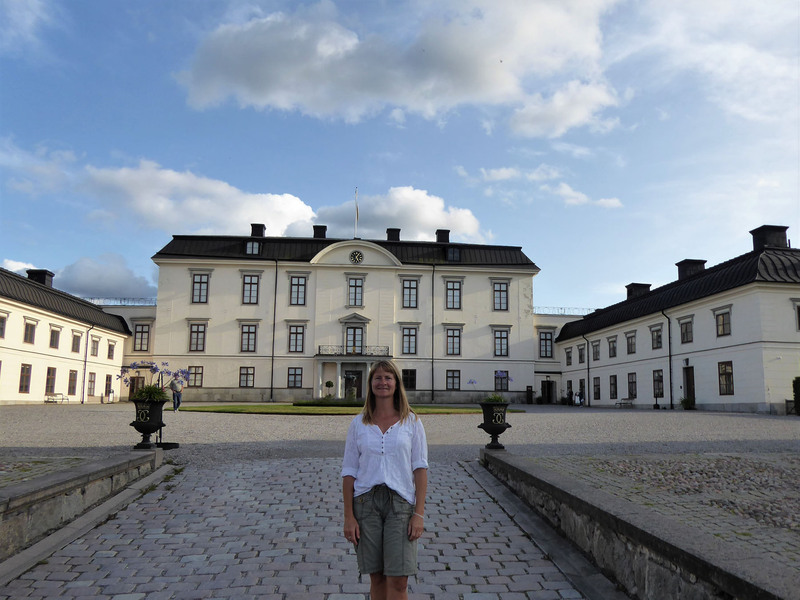 We woke early up on a grey but brightening morning in the very comfortable free aire in Karlskoga. It would have been so easy to linger another night, enjoying the view and a few lake swims, but we conspired to make a change. The forecast for the region suggested there would be only two good days of clear sunny weather in the next ten; today and tomorrow. 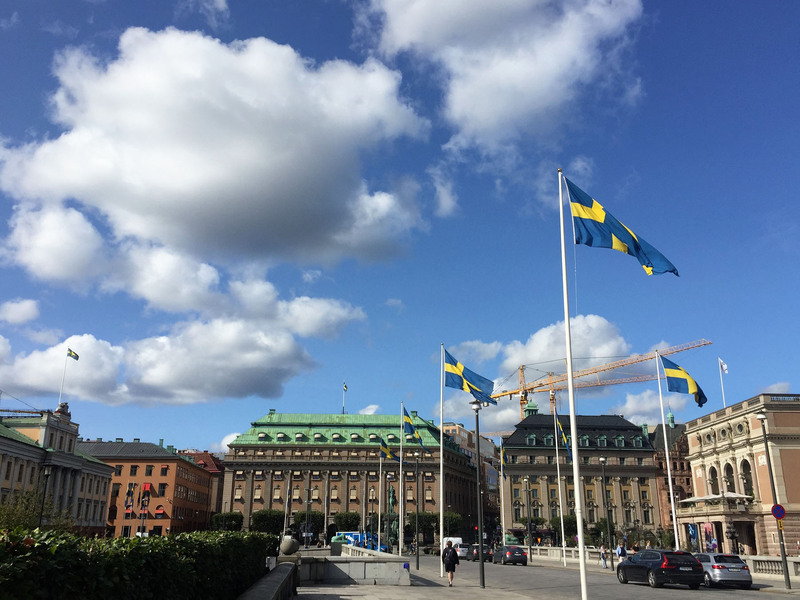 With some trepidation as we were still a long way west we decided, perhaps a little flippantly, to spend them in Sweden’s capital. Decision made, we got packed up and organised, serviced Benny and hastily left all before our dashboard clock showed 8am. 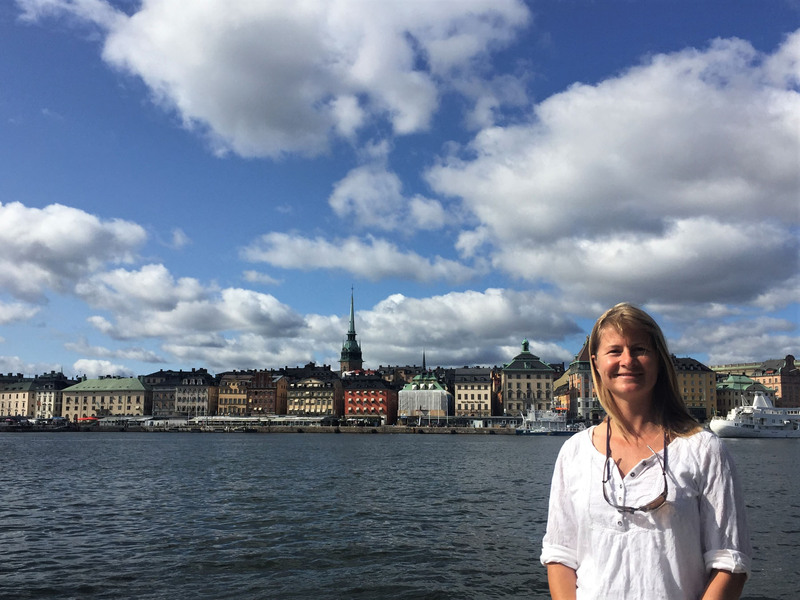 There was a little over three hours driving between us and Stockholm. 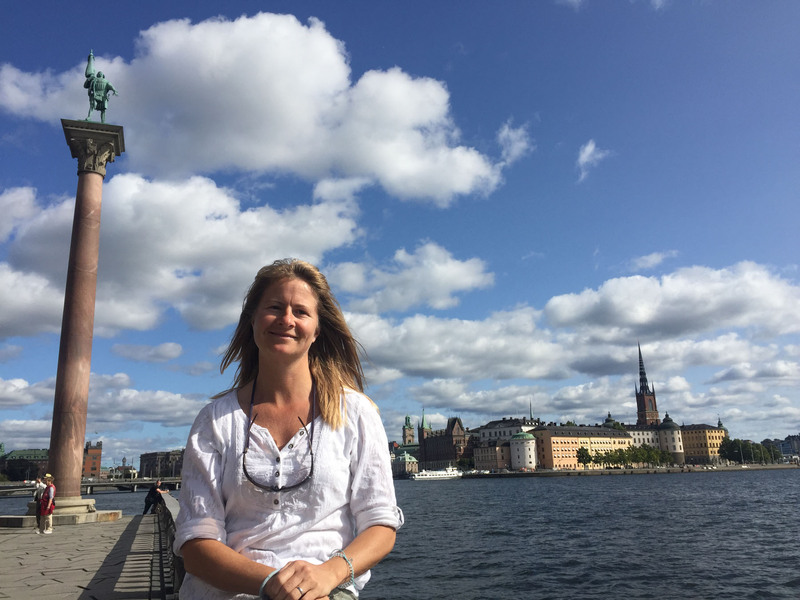 We had hoped to follow in OurTour’s footsteps and spend a few cheap days on the island of Skeppsholmen, but we found the marina area was closed for construction works. The other nearby parking areas on the island had updated parking machines that explained in multiple languages that the still available 60 SEK overnight ticket was strictly for residents only and could only be purchased in conjunction with a separate residency card. We could have chanced it, but they seemed to have gone to a lot of trouble to explain that we weren’t meant to. Our hope of a few sneaky cheap nights in the city centre gone, we paid instead for several hours of day parking and set off to explore on foot. The sun was shining from a clear blue sky, and the cityscape looked simply fantastic. We were in no hurry to see anything specific and just doodled along in the warmth of the day, taking it all in. 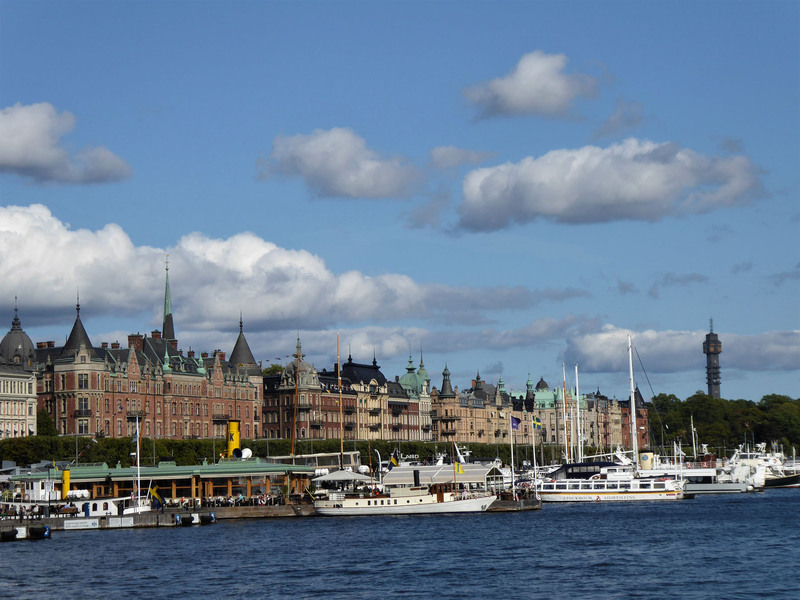 Passing through the island park, we crossed the bridge from Skeppsholmen to the busy central promenade, following the curve of the water around to another bridge leading to the old town. 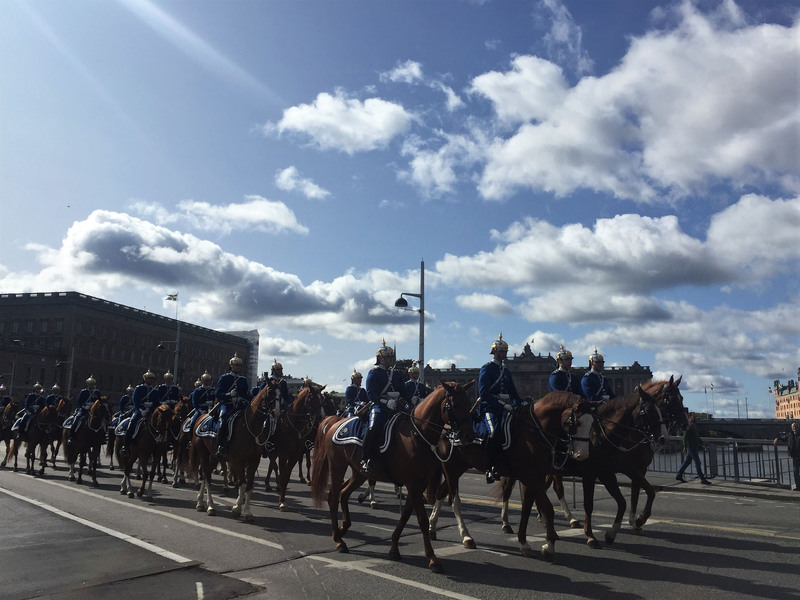 We were passed by a parade of military horsemen returning from the changing of the guard at the Royal Palace to their barracks, who collectively obeyed the red lights like normal traffic. 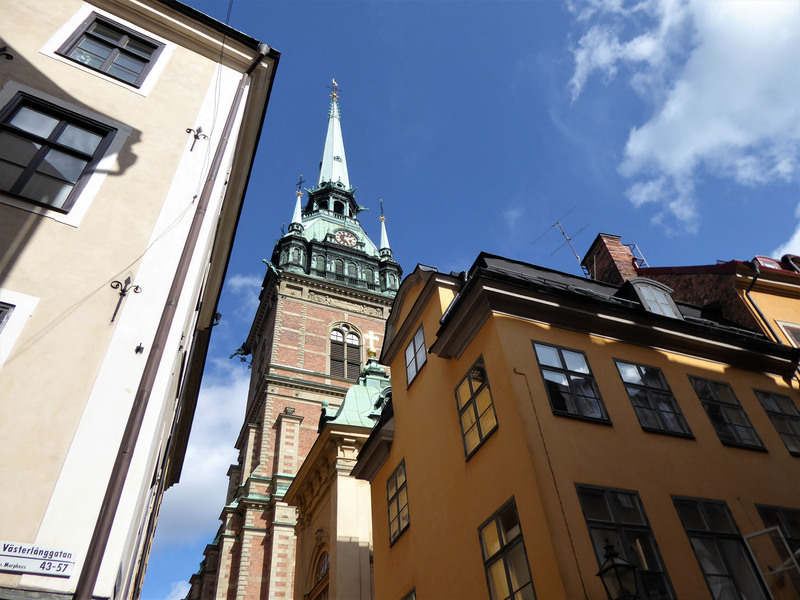 We wandered the streets of the Old town on Gamla Stan, dodging the colourfully-dressed zombies on walking tours. 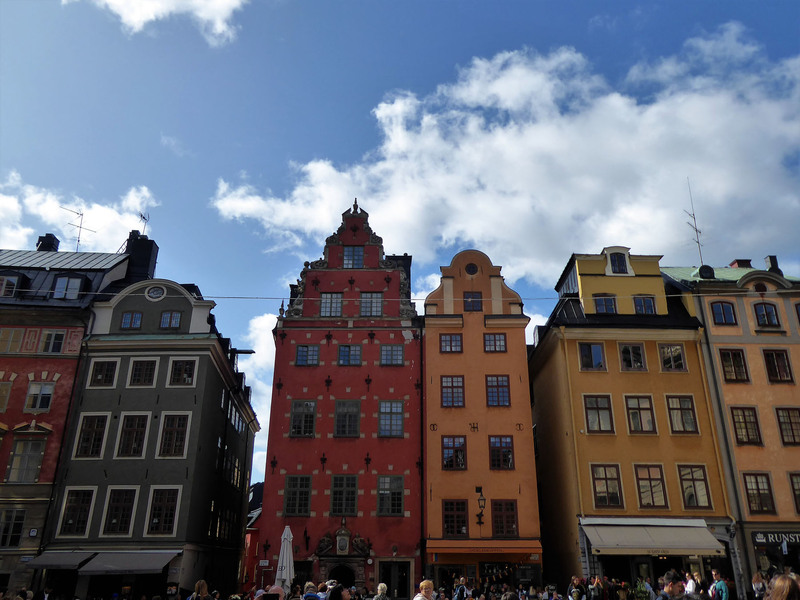 We browsed the many shops in the busy side streets of the old town. 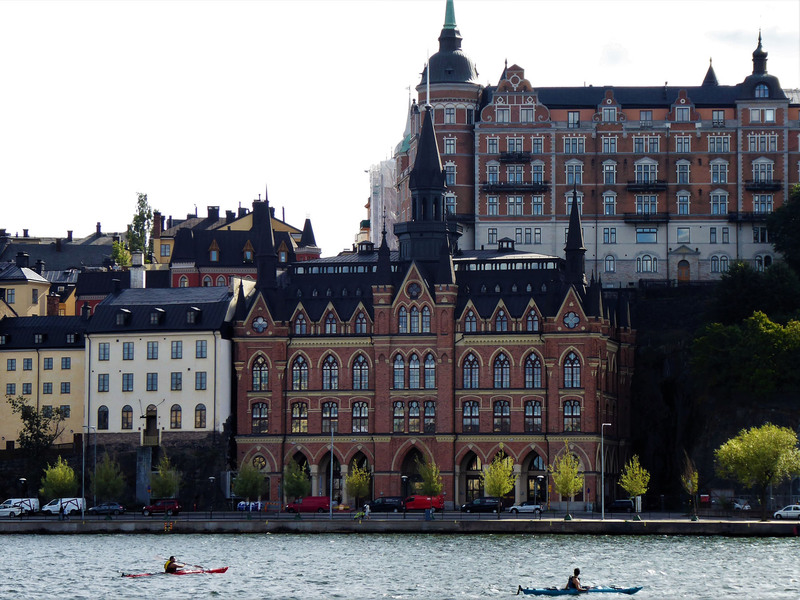 We ate ice cream on a bench outside the Royal Palace and watched the world go by. 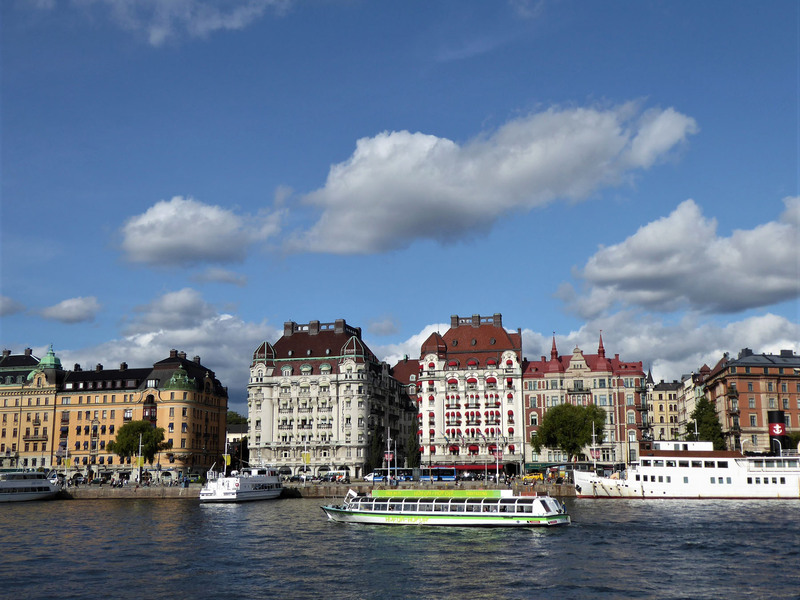 We had arrived early into the city, the weather was terrific and the atmosphere relaxed and easy, so we simply switched off and lived in that simple moment. Several kayakers slid by on the calm sea and we mused on whether a water-level view of the city would be interestingly different and if we should join them, but we were too infused in the lazy, sunny day to motivate ourselves to organise it. 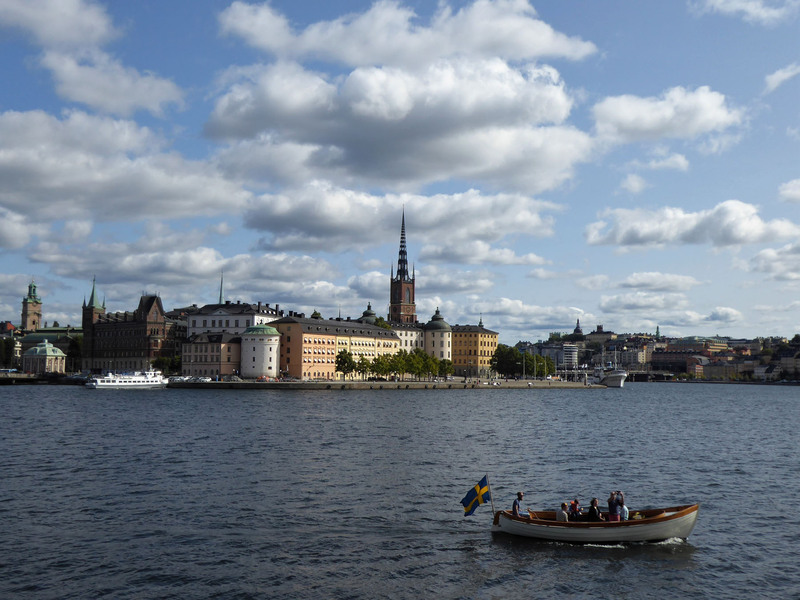 Instead we crossed to Riddarhomlen, a small island on the west side of Galma Stan, where we ate our lunch early, on a wooden bench looking out over the harbour waters and facing towards the domineering Stadhuset, Stockholm’s city hall. Sated, we traipsed across the noisy, narrow pedestrian portion of the railway bridge to the opposite quay front, reaching the dominantly funky Radisson Blu hotel. 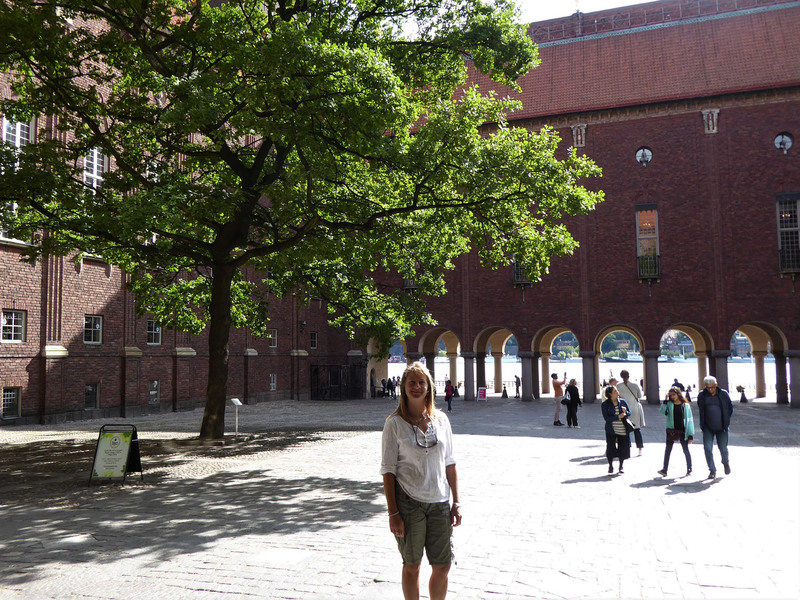 Another short bridge led us to the side of the austere Stadhuset, and we turned through an archway into its wide Civic Court. Over eight million bricks, known as munktegels (Monk’s bricks) due to their traditional use in monastery construction, made up the impressive building, its overall design inspired in part by Renaissance palaces in Western Europe. 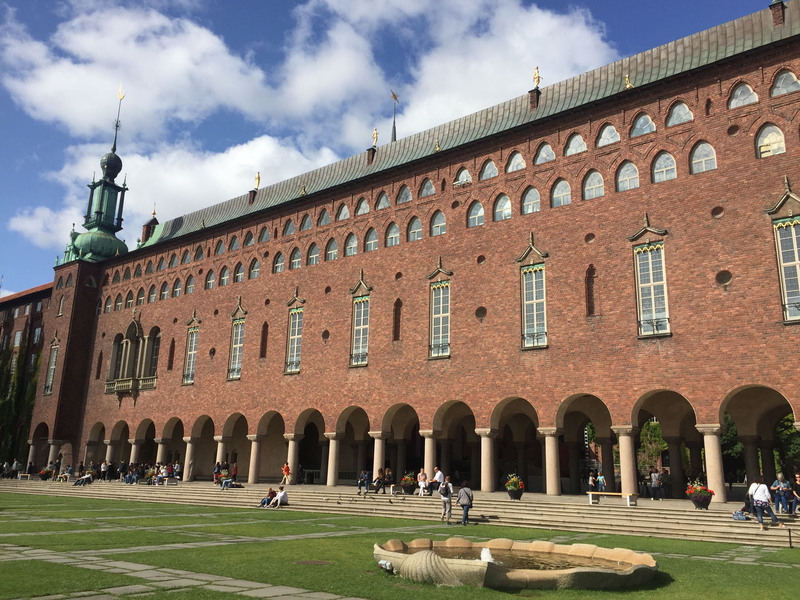 It was constructed around two main colonnaded squares, and the mosaic-clad Golden Hall within the walls is famous as the site of the annual Nobel Prize banquet. 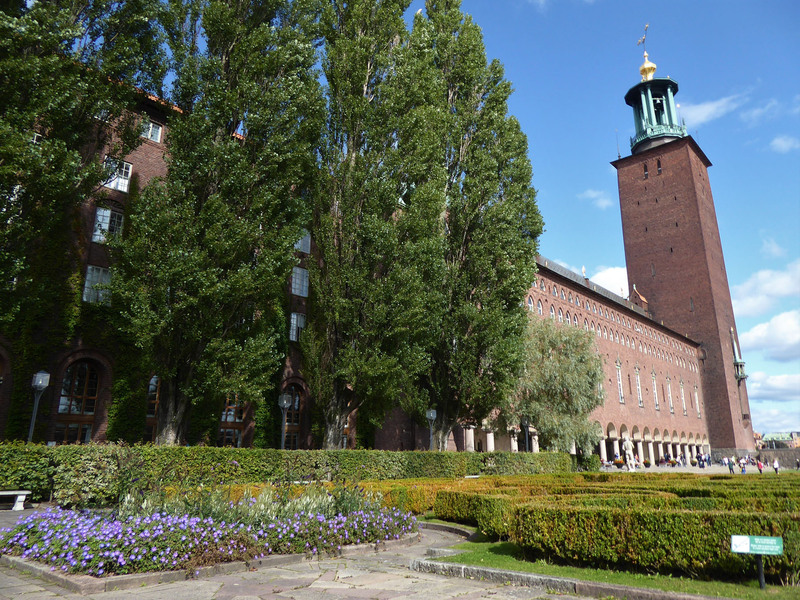 We spent some time around the garden courtyards looking out over the shining waters of Riddarfjärden to the old town. Scaling the corner tower, 106m or 365 steps high, was originally part of our plan, but the scheduled climbs, seemingly based around bell-ringing times, were booked out for the next few hours and we didn’t manage to return. Instead we walked the gardens, enjoying the many sculptures and delicately arranged flowering arrangements. 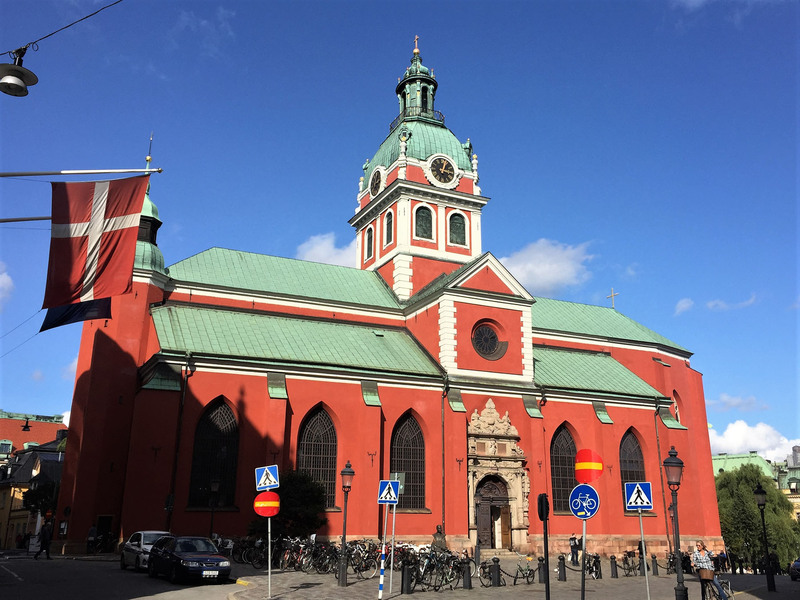 The otherwise monolithic brick façade was delicately decorated, almost Venetian in style, with tall, playful turrets topped with moons and stars creating a more Eastern flavour. 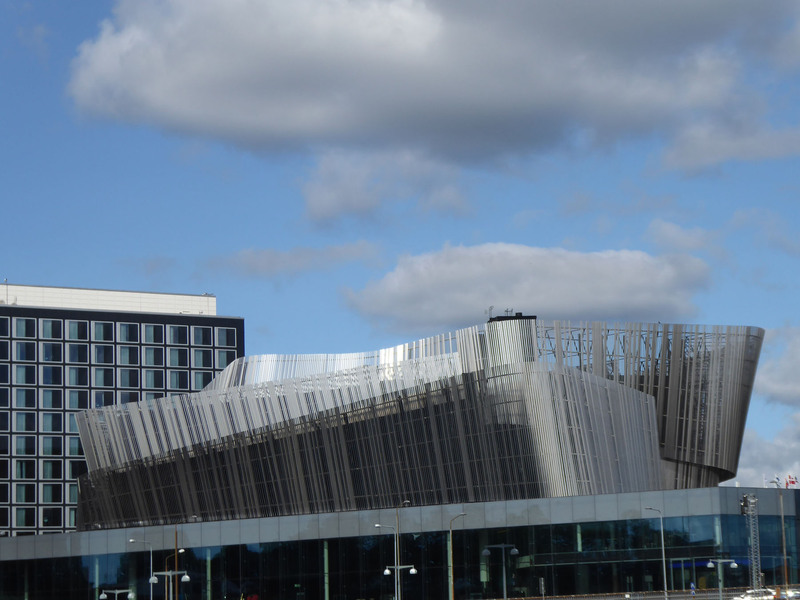 It was an eclectic style, but distinctly Scandinavian. 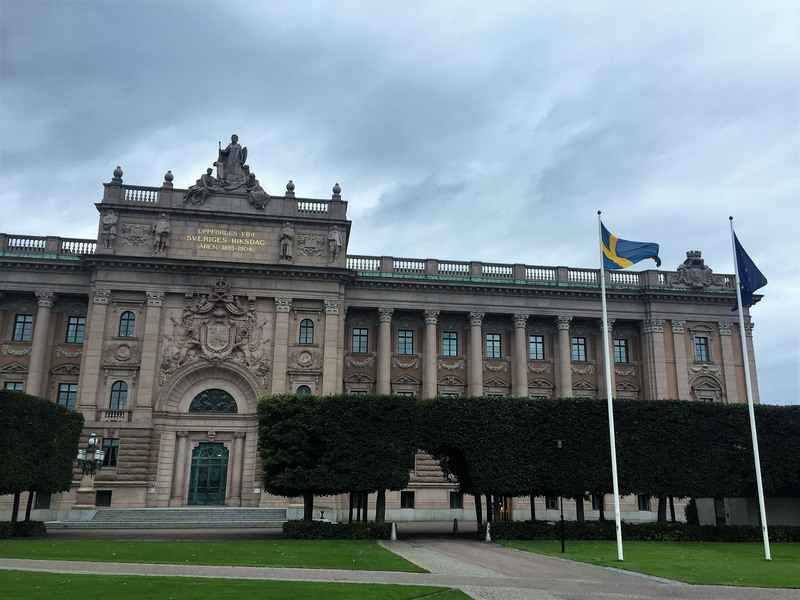 We continued our rambling tour, crossing back to Gamla Stan before exiting the island again by a different bridge, to pass by the flag-lined avenue in front of the Parliament building. 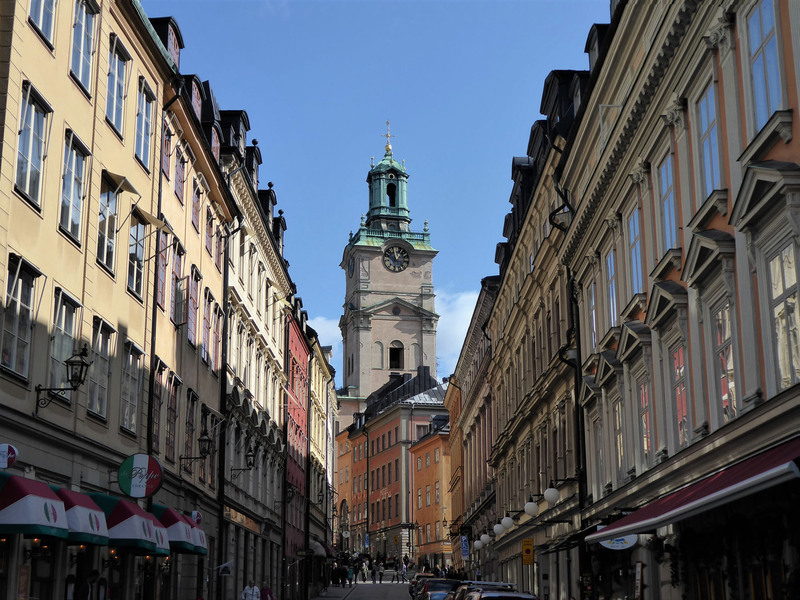 We turned right along the waterfront, passing several lovely squares and the bright red St. Jacob’s Church, as we explored the more modern streets of Stockholm, lined with designer shops and familiar brands. 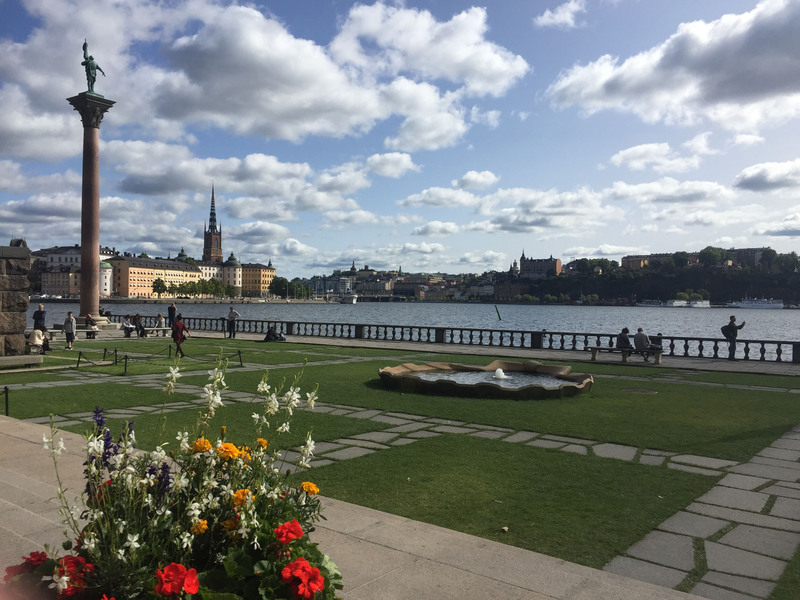 We crossed the jutting peninsula of Blasieholmen to view the colourful cityscape of the opposite bank, then walked along this promenade with views across to the museum-heavy island of Djurgården. 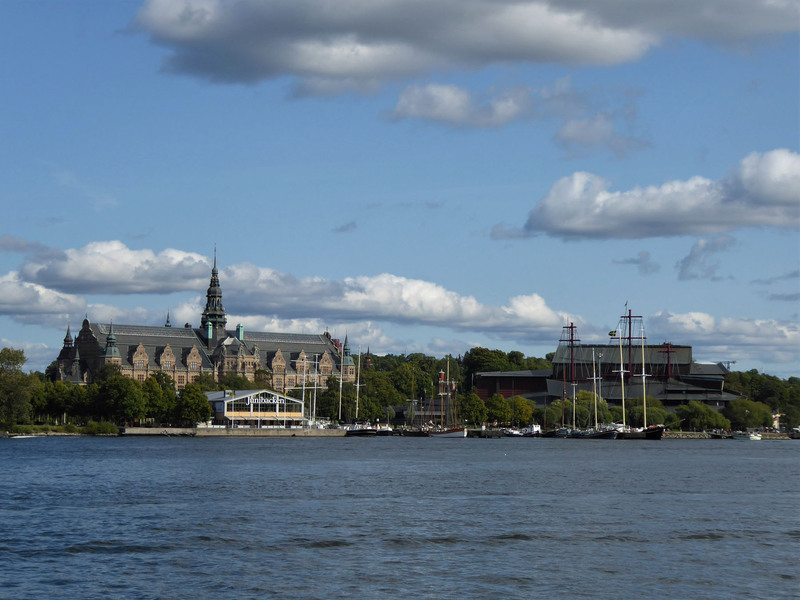 We could clearly pick out the Nordic Museum and the Vasa museum from our vantage point, and made loose plans to visit the island on our next visit to the city centre, likely tomorrow. Worn out from all our walking, we returned to Benny to formulate a plan, and decided to spend the night outside the city to the north. 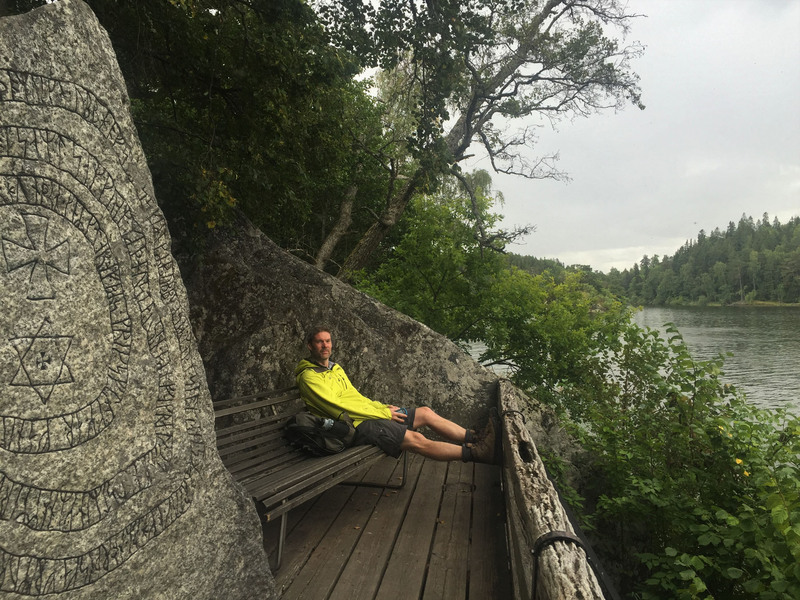 We set off at 4pm, on a Friday afternoon, to head to Rosersberg Castle. A rookie mistake, as we soon enmeshed ourselves fully in the mad traffic rush from the city. We struggled for the best part of an hour to break free, finally reaching an open stretch of the E4 and cruising smoothly up to Rosersberg. We parked in their large gravel car-park that doubled as an amenable free aire and finally relaxed. We had a quick walk up to the castle, now a posh hotel, before returning to settle in for the night. Surprisingly, we found we could pick up an open WiFi network from the hotel too, so were happy nestling in our little cocoon as darkness descended. The next morning we had planned to return to the city, but the weather had turned and our predicted two days of sun had been reduced to one. It was grey and damp, and reading up on city activities, we noted there were several events that would greatly increase Saturday’s crowds, so with memories of Friday’s traffic still raw, we decided to spend another day locally in Rosersberg before revisiting Stockholm the following day to see a few of the special, internal attractions we’d studiously avoided due to the wonderful weather. This gave us a lazy day to walk around the extensive castle lake and gardens with the bonus of free city parking on Sunday when we returned to the city. The next morning we had a very lazy start, sleeping long and only slowly emerging due to the invasive noise of spitting rain outside. We sat it out and it dried up nicely around lunchtime, so we booted up and headed out for a walk around the lake shore and grounds. We followed the easy paths through the forests, enjoying our fresh-air amble. 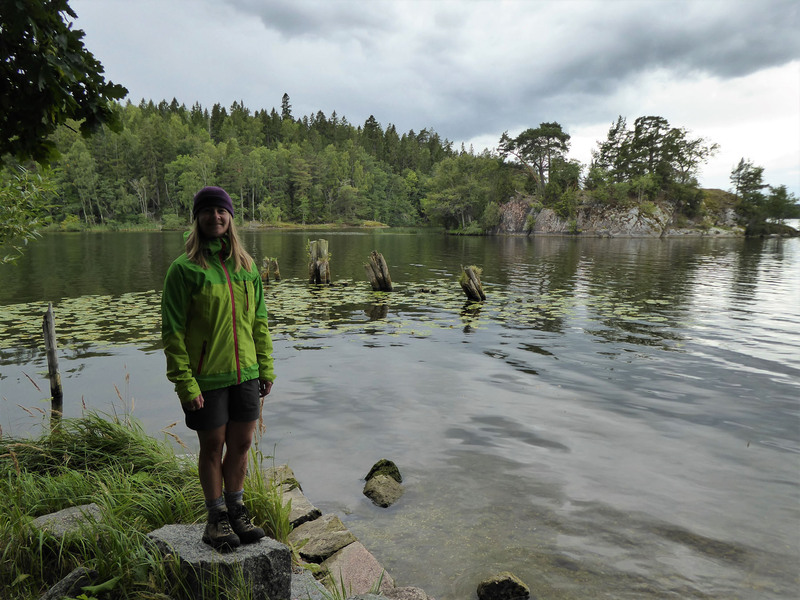 We discovered grottos decorated with carved runes, quiet bathing spots and clearings in the trees with fancy wooden houses. We sat a while on a quiet quay, looking out over the large lake, before returning through the apple orchards at the rear of the hotel. 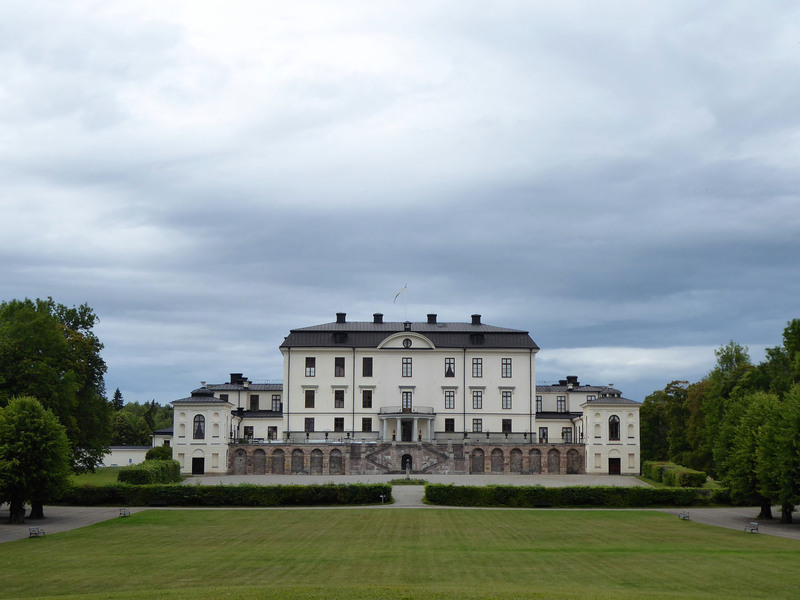 Our informal walk began and ended with the formal structures of Rosersberg Slott. We passed another quiet night in the grounds of Rosersberg, accompanied only by birdsong, as we made plans for our return visit to Stockholm. 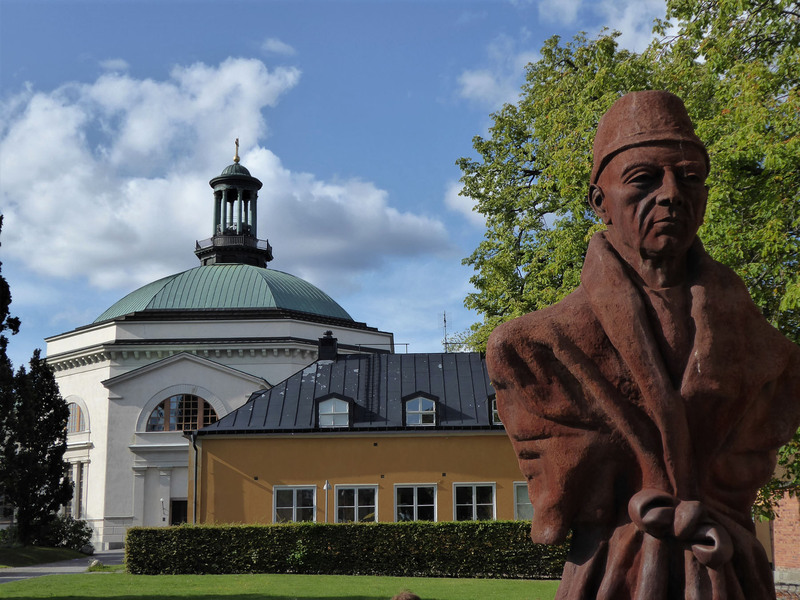 Tomorrow was, we decided, to be a Vasa Museum day, come rain or come shine. 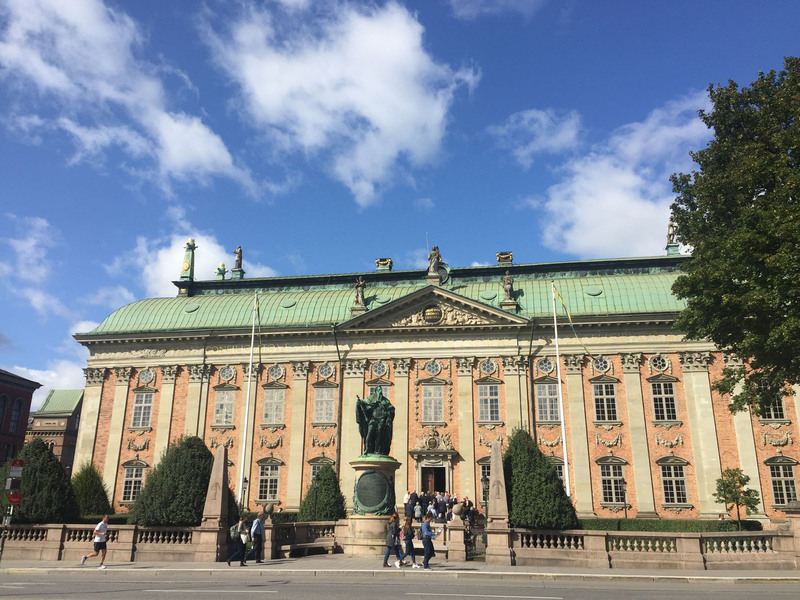 This entry was posted in 2017 Scandinavia Tour, In Sweden, Our Travel Journal, Sweden and tagged capital city, castle, church, city break, forest trails, history, old town, palace, sightseeing, stockholm, Sweden, town centre, town hall on Sep 12, 2017 by Aaron Hill.